Loving Work: Is it Possible? They say if you do what you love for a living you will always be happy. I have also heard if you do what you love money will follow. I am not sure the second statement is true because in my mind if you do what you love and you turn it into a profession the fun slowly evaporates into work. Then how do we make a living at doing something we love? I am finding this out through my own journey. I make these cute little guys called Cuddle Wumkins. 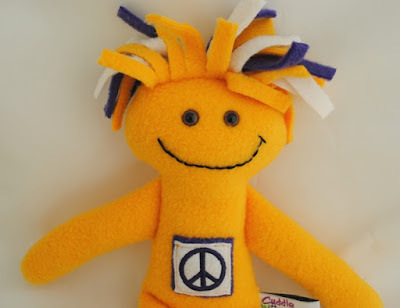 Cuddle Wumkins awaken our imagination and bring us back to a more simple time when life was not so complicated. A time when a plush toy gave us comfort by being our friend. Every time I fininsh sewing a Cuddle Wumkin I smile. I love their silly faces and plump bellies. I imagine what a child will feel holding it close and looking into its eyes. Then I become excited for another day of sewing and I look forward to my sales and seeing the expression on people's faces when they get a chance to experience them first hand. It is a gift to be doing what I love and luckily I have a husband that supports me in many ways so I can find out in this journey if the second quote is true. That when you do what you love the money will follow. I will keep you posted on that! Announcing my shop opening today April 14, 2011. Please drop by and see what I have. I design and sew Cuddle Wumkins. I call them that because they aren't a specific anything and they needed a name. My family was brainstorming names last year and my beautiful daughter threw Cuddle Wumkins out and it stuck. Here is what they look like. They all have floppy hair and a big smile but their colors and decorations always change. Seldom will you find any two that are the same. Two may look the same but like twins there will be subtle differences. 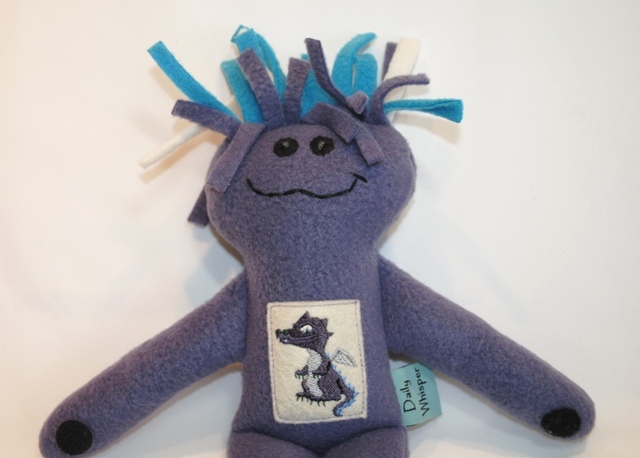 This means that you will always have a one-of-a-kind toy handmade especially for you by Barbara at BSL Creations. I love my job! Words are powerful and it has taken me most of my lifetime to learn how to say what I want to say. I still am learning but I am much better today than I was in my early years. I wanted to share this video to help us all remember to choose carefully what we say especially if we want a positive outcome. I hope you enjoyed it. I am happy to say my pattern is finished! I had 2 friends give it a whirl and it passed the test. You can purchase it on my Etsy site. I made it very easy to follow so if you are new to sewing or a seasoned seamstress you will find it satisfactory. Cuddle Wumkins have positive messages or fun patches on their bellies. Here are two dolls with a message of peace. Available today on my Etsy shop for $18.00. This picture shows why I love what I do. 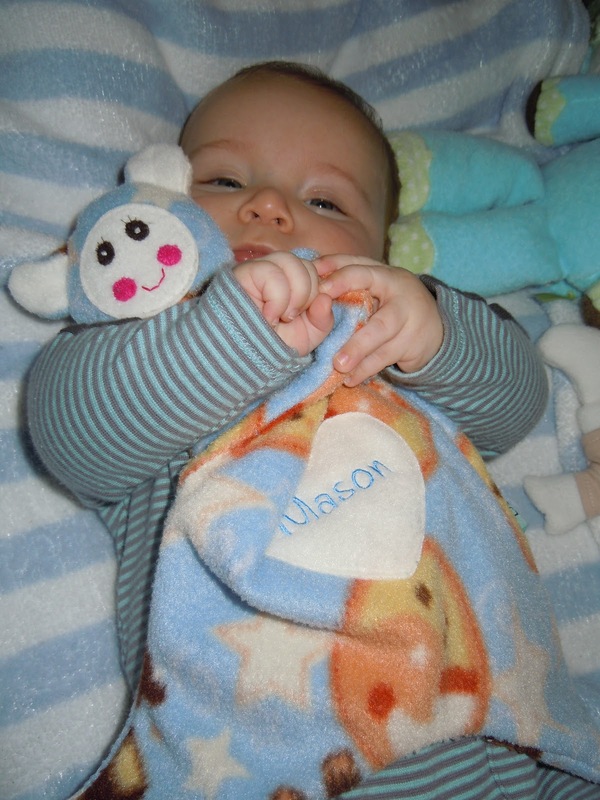 This little guy is holding his custom Comfy Bear Blanket given to him when he was born. Having something soft to hold is nice for anyone, young or old. Last week a woman purchased my gold colored bunny for her 82 year old girlfriend. There are no age limits, all is needed is a young heart to enjoy my plush toy line. It turned out to be a beautiful day for a craft show. One of the perks of being a vendor in a show like this are the other vendors you meet. I had a nice time speaking with the following people and their businesses are worth mentioning. Nicole Carson has a business called SnapnStep. She designed a much needed product that keeps shoe laces from coming untied. It is such a perfect solution for an everyday problem. Ramona Garcia sells Silpada Jewelry. If you haven't seen this jewelry you should look at the line. The pieces are absolutely beautiful and they are made with sterling silver. Ramona comes to your home and does a private showing for your friends. All party sales go toward a credit for you to buy jewelry. It is a great way to get free stuff and you will love Ramona; she is beautiful and kind. 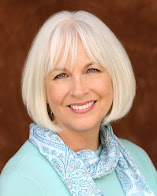 Check out her webpage at MySilpada. Pricilla Robledo designs the prettiest jewelry and you can find her line at TheLilacLeaf. Jennifer Ellena has a business making boutique style clothes and hair accessories for your little ones. Her line is so cute. Check it out at her facebook page Ellenasboutique. Kelly Buscaglio designs baby blankets. Her store caught my eye because she has tooth fairy pillows. Of course I had to check out my competition! Kelly is a sweet lady with amazing skill and her product line can be seen at KelleyB. My only regret was that I could not meet everyone. It was a fun event and maybe next time I will have a helper so I can leave my booth for more that a few minutes.